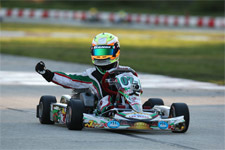 Heading to round three of the USPKS the weekend after claiming his Rotax Mini Max National Championship, Tavella would tackle the demands of the Pittsburgh International Race Complex in Wampum, Pennsylvania. 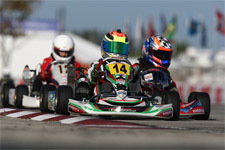 Mini ROK competition on Saturday saw the Massapequa, New York resident third in morning qualifying. Staying in third for heat one, but posting fastest race lap, the hot shoe took the heat two win. Battling for the win, but playing the points game smart, Tavella went on to post a second place podium result in the day’s main event. Yamaha Cadet proved to be a wild ride on Saturday in Pittsburgh, as the GT7 Motorsports/Tony Kart pilot found himself back in ninth after the qualifying session. Making quick work on the field, Tavella moved up to challenge for the lead in the first heat, only to have contact relegate him back to 16th. Heat two was another story, as the young gun went on to take the victory. 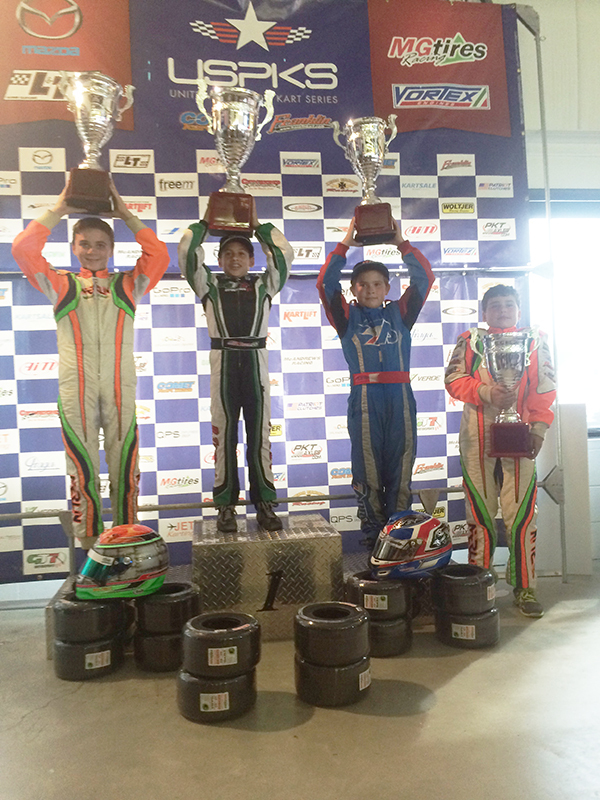 With a photo finish deciding the final victory, Tavella edged out his competition to take the day’s Yamaha Cadet win. Sunday in Pittsburgh saw Tavella add a third place podium result in Mini ROK, with the results coming down to the last corner of the last lap. In Yamaha Cadet action, Tavella took the lead early, but stayed out of trouble as a quartet of drivers drafted by, eventually finishing fifth overall. Taking in an extra event before the USPKS series finale at the New Castle Motorsports Park in New Castle, Indiana, Tavella contested the WKA Manufacturers Cup at the same famed karting venue over the August 8-10 weekend. Starting out fourth in Saturday qualifying, Tavella moved to P2 in the prefinal, before earning a WKA Man Cup victory in the Yamaha Sportsman category. 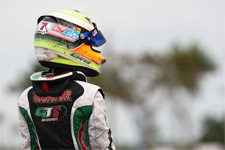 Sunday saw the two-time US Rotax National Champion start strong with pole in qualifying and the prefinal win with fastest race lap. The final again saw Tavella on the podium, this time on the second step. Back to New Castle for the USPKS finale, Tavella and his fellow competitors would battle changing weather conditions throughout the event. Keeping his focus on the championship points race, Tavella started strong with a qualifying lap seven-tenths clear of the Yamaha Cadet field. Using his speed in the first heat, Tavella took the win before rain started to fall for heat two. With 15 minutes to change to a wet weather set-up, the Tony Kart pilot again took the victory, this time with rain tires. Again racing in wet conditions for the final, a trio of teammates relegated Tavella back to fourth in the main. 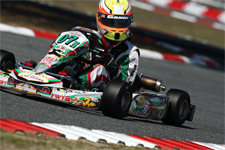 Mini ROK saw Tavella post a strong P2 in morning qualifying, and claim third and a win with fast lap in the two heats. Losing out on the draft in the final, Tavella was just off the podium with his fourth place result. It would all come down to Championship Sunday, and the day would not start well for Tavella. Only clocking 18th fast in Yamaha Cadet qualifying, the young New Yorker would need to make up ground in the wheel-to-wheel action. Charging up to fifth in the prefinal, with his five points separating the top-two in the championship battle, Tavella showed his prowess. Fighting for the race win, Tavella emerged not only the victor but the Yamaha Cadet class champion as well. 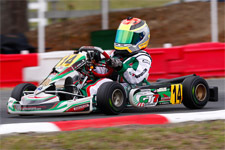 Mini ROK saw Tavella post P3 in qualifying, before moving up to second in the prefinal. 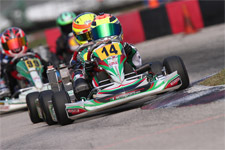 Finishing with a fifth place result in the final, Tavella would have enough of a points advantage to secure his second championship title in the 2014 USPKS. Dylan would like to thank Mark Coats and the entire staff of the USPKS team for putting together one of the best racing series in years, master tuner Charlie Swayne for working with the Mini ROK and tuner Daniel Moffet for his work with the Yamaha, and engine builders Woltjer Engines in Yamaha and Bordogna Engines in Mini ROK. He would also like to extend a thank you to all his sponsors: Philip Joseph Jewelers, Argyle Jewelers, GT7 Motorsports, Diversified Private Wealth, K1 Race Gear, Oakland Valley Race Park, Iron Rock Motorsport, and A.G.C Machine Corp.